We explored Detroit. Many of us experienced culture shock in varying degrees. Pictures are supposed to speak a thousand words, but in this case, experiences are better. Some of us felt strange taking pictures, like tourists in a person’s home. Discussions of selfishness and selflessness arose with a city tour as its spark. Having the evidence of a seemingly fallen city in front of you changes views and goals. Why are we here? What makes this break any different than a rocking spring vacation? In the end, we could agree that there is no right answer; there is no perfect model to follow for performing service. We can only be honest and intentional. Monday: We’ll start today’s entry at the end. After a full day of work with Nortown CDC, we walked over to a neighborhood park with a basketball we found on the side of the road. While we were still a block away, some basketball players called us over to play 4-on-4. Although the game came down to the wire, the Detroiters constantly praised our mediocre skill. They were emphatic and genuine and the interaction left us out of breath and feeling welcomed. For most of today, we worked with an organization called Nortown Community Development Corporation (CDC) whose focus is the restoration of Northeast Detroit. Their work centers around avenues of economic development: affordable housing, urban infrastructure, job training, beautification and education. The director, Pat Bosch, her husband, John, and one of their community partners, Karen Washington, emphasized the importance of collaboration throughout the day. This point in particular was echoed in a lot of what we did. We began at an empty lot where someone had dumped piles of wood and concrete before the recent snow. Half the team set to work clearing the curb of litter while the rest of us loaded truckloads of the heavy debris and transported it to the dump. During a lunch of home-cooked lasagna, quiche, turkey and tomato soup, Pat peppered us about our backgrounds and thanked us for our help at a site they had been forced to ignore given their workload and the intensity of the labor. We were surprised by her gratitude and wondered if we deserved such thanks, being short-time visitors. An hour later, as we picked up trash on an island in the middle of a busy street we continued to feel like outsiders. Yet although we felt exposed and vulnerable standing there at rush hour, we constantly received positive responses from passers-by. Some people honked their horns and waved a hand, some pumped a fist, others paused to ask us about the work. Again, we questioned our deservingness, but ultimately we came away with a sense of positive visibility for Nortown CDC. We realized that by working with this grassroots organization, we’re simply furthering their goals. Like the basketball players, the people in Northeast Detroit and Nortown CDC welcomed us for what we had to offer, regardless of what we lacked. After such a constructive day, we’re really looking forward to the rest of the week! 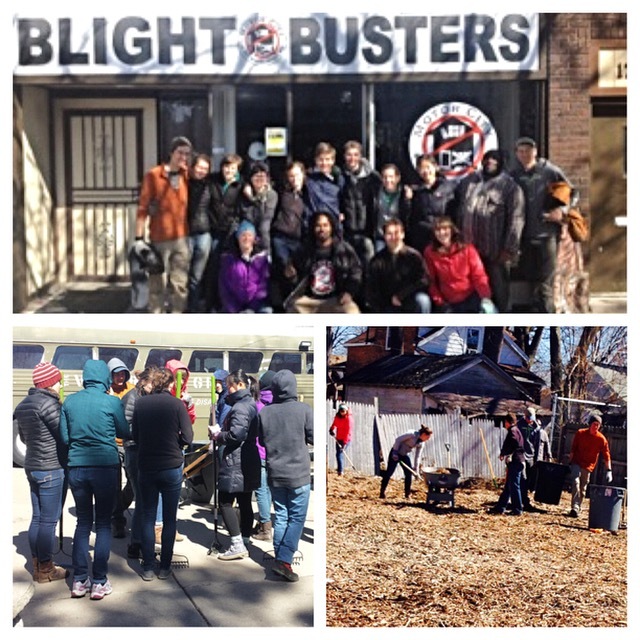 Today we spent the day working with a nonprofit called Motor City Blight Busters. 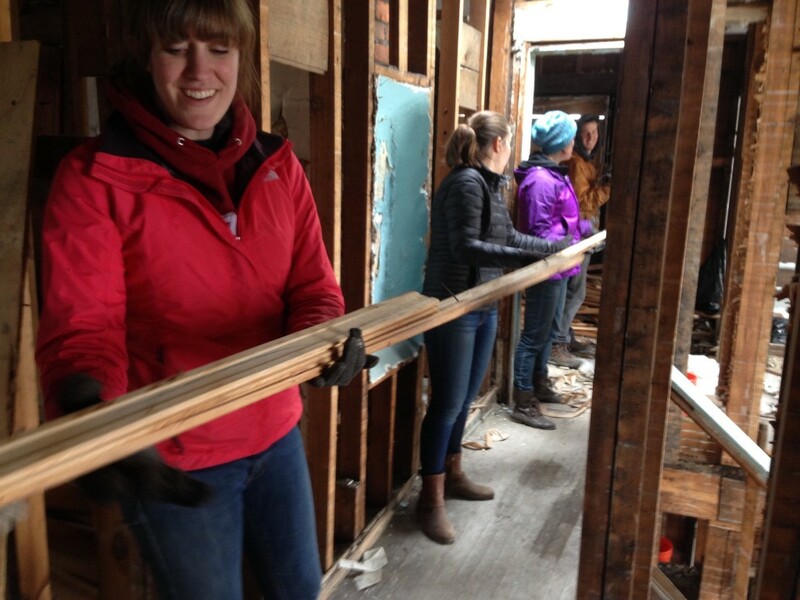 Blight Busters does work around the community to tear down abandoned houses. One of our leaders was named Gordon, who was a veteran who has been working on getting more veterans involved in community service to continue their skills in leadership. Along with volunteers, Gordon’s focus has been on disaster relief, including Hurricane’s Katrina, Hurricane Sandy, the earthquake in Haiti, and many others. He envisions Detroit as a disaster area moving at a slower pace in which he can both help make Detroit more sustainable and prepare volunteers for more pressing situations. Gordon’s innovative approach in both reaching out with social media and bringing in community members to participate emphasizes collaborative effort. Along with Gordon, we also worked with community members Jamie and nineteen-year-old D, who had fallen in love with the community and were excited to improve it. Several of us talked about the Detroit rap scene and were surprised to find that they had not listened to any Danny Brown, a famous Detroit rapper. We showed D the song “Let’s Go” and he seemed like he might check Danny Brown out though he was skeptical of his flow. Together, D, Gordon, and Jamie formed a very cohesive team sharing a common goal. Most of our day was spent spreading mulch around an empty lot. The purpose of this was to lay the groundwork for future top soil on an urban farming project. Afterward, we collected garbage from the lot across the street. After carrying this garbage back to the dumpster, we called it a day. For dinner, we met up with Sofia and Chelsea, current volunteers who have been in detroit for about seven months each. Having worked with various charities and community members, they offered a broader view on how our contributions–even though we are outsiders here for only a week–fit into the larger goal of the rebuilding Detroit. Today, we spent the morning busting blight. We scraped paint off of a concrete floor in the Blight Buster building which was covered with rad murals. We also picked up trash in and around the Blight Buster facility, and cleaned out their storage room. Next, we got delicious shakes and cakes at the next door coffee store. Then we went to the Michigan Urban Farming Initative. Rather than farming (since it is winter and there are no crops), we worked on restoring a blighted house that was donated to the MUFI. We pulled nails out of the walls and replaced pipes in the basement, and we also gathered fallen plaster which was hazardous so we wore gas masks. Throughout our work we sang songs and had lots of super fun. Here is our joy, expressed in the form of a poem. Today we had a free morning to explore D-Town a bit more. We went across the pond to Belle Isle where we could see Canada and almost lost a stray tennis ball during an intense game of Spud. We explored the Detroit Institute of Art for an hour but all felt that the hour given to us was not nearly long enough. The walk-in Portrait Gallery there showed many different sides of Detroit life, including portraits of urban farmers, artists, students and protesters. We are starting to get a better sense of the Detroit community as a whole and seeing two views of the city: a view of abandonment and a view of hope. In addition to the community that we have come into, we are forming one with the group we set out with, and we felt that especially today as we explored the city. For lunch we met up with Alice Bagley, a recent Whitman grad who has both started her own non-profit urban farm and worked with other Detroit non-profits. She talked about the value of being able to work for someone without feeling as if it’s your job to fix things in a city that you are unfamiliar with. Local community involvement and leadership is one of the best ways to foster growth and development, and maintaining a sense of humility as an outsider goes along with that. Our work this afternoon with Green Living Science challenged and ultimately reinforced this idea: the tasks that we were doing at GLS were not flashy or huge undertakings, but it was not our place to question what they needed us to do. This is a tension we have all been feeling throughout our time here- questioning the impact of our work but knowing we’ve only given these organizations a few hours of our time and that they know better the work they need us to do than we do. We’re heading in to our last day of service tomorrow with some questions and group goals, and hope to finish the week with a better understanding of the city’s issues and progress. As our last day of organized service, Friday gave us an opportunity to see the people who were benefiting from our work with the organizations. We were grateful we got to interact with community members of Detroit who have experienced the ups and downs of the city. In the morning we worked with CASS Community Services, which provides housing and job opportunities and training programs for people who are homeless. As a part of their job training, the workers at CASS Green Industries taught us how to make mud mats from tires that have been dumped illegally in Detroit. We also worked in the paper sorting and shredding part of the plant. At the end of the morning, one of the workers shared his feelings about the work accomplished at the plant. He spoke about how he interprets his work as only a small dent in the work that needs to be done; but if he dwelled on how small of an impact he was making then he wouldn’t even try to make any impact at all. All of the people who need the provided services appreciate CASS’ work greatly. In this sense, the worker reminded us to appreciate the connections we made and the work we accomplished, however small, during our short time in Detroit. We finished the afternoon back at MUFI (Michigan Urban Farming), and while we had heard concerns about how they had stepped on other organizations toes–perhaps related to the fact that the some of the founders are not originally community members of Detroit themselves–ultimately, they are getting results. When we were about to walk back to our church, a man on a bicycle rode up and asked about how he could work in their garden. It was reassuring to see that community members were utilizing the resources that MUFI seeks to provide. Reflecting on the day, our group really appreciated our time at CASS. Right as we were planning to leave, Willy, who worked in CASS’ kitchens to help feed hundreds of people a day, left us with this to think about: “Don’t worry about the person in the past or the person you want to be in the future, just be the person you are today.” Today we are compassionate, active citizens in the Detroit community. Thank you, Willy, and everyone, for welcoming us to the D.